Liz Ann Sonders: Recession Inevitable, the Question is When? 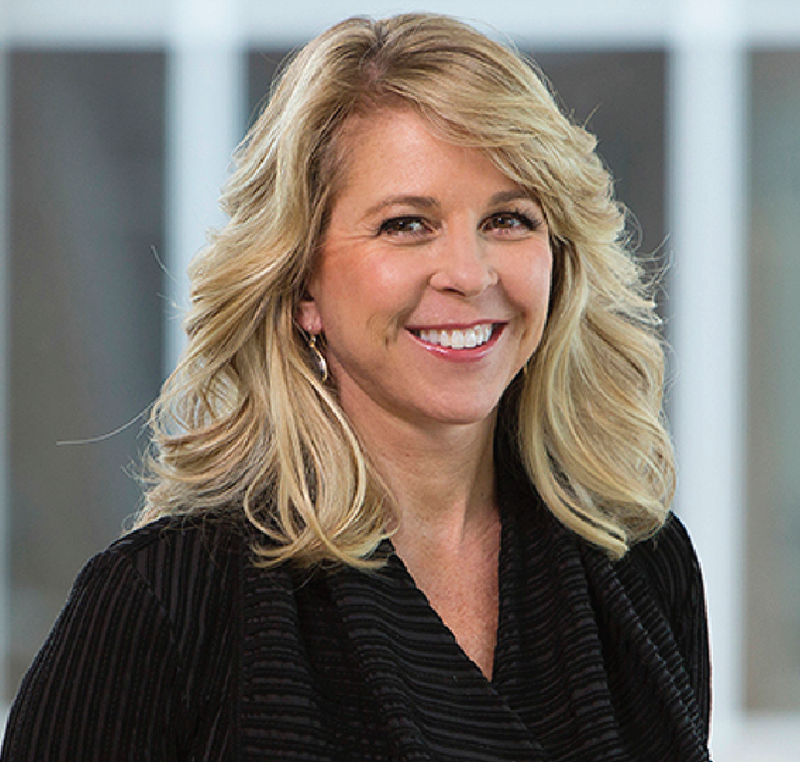 Liz Ann Sonders (Chief Investment Strategist, Charles Schwab & Co.) provides insight on what happened in the market in 2018 and her outlook for 2019. 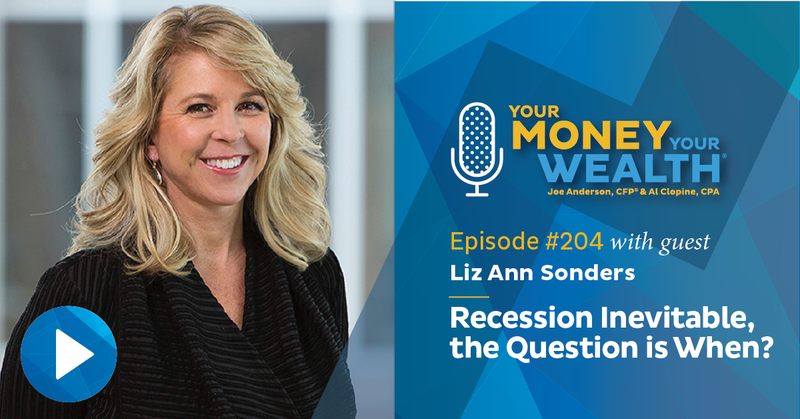 Liz Ann discusses the causes of recent market volatility, the Fed funds rate, the possibility of a recession in 2019 and what investors should do now. Plus, Joe and Big Al answer your email questions: If you’re saving 55% of your income, should you keep saving or have more fun? Should you save for kids’ college or your own retirement? Isn’t deciding when to take Social Security a lifestyle choice? Finally, a look at how the gurus fared with their 2018 market predictions. (37:49) 2018 Predictions: How Did the Gurus Fare? “Well, we are going to get another recession. That’s inevitable. It’s just a question of the length of runway between now and the next recession.” – Liz Ann Sonders, Chief Investment Strategist, Charles Schwab & Co, Inc.
That’s Liz Ann Sonders, Senior Vice President and Chief Investment Strategist for Charles Schwab & Company. Today on Your Money, Your Wealth®, Liz Ann joins Alan Clopine, CPA and Pure Financial Advisors’ Director of Research, Brian Perry, CFP®, CFA to discuss the causes of recent market volatility, the Fed Funds rate, rolling bear markets, and what investors should do in 2019 to prepare for the inevitable recession. Plus, Joe and Big Al answer your money questions: If you’re saving 55% of your income, should you keep saving or have more fun? Should you save for kids’ college or your own retirement? Isn’t deciding when to take Social Security a lifestyle choice? And finally, how did the gurus fare with their 2018 market predictions? Let’s get things started with a quick look back at 2018. Here are Joe Anderson, CFP® and Big Al Clopine, CPA. Joe: Markets were down. Bonds were flat. And 2019, hopefully, will be better. Joe: The U.S. markets were down 5.5% as a whole. International markets were down about 15%. Al: Yeah. And collectively it was around 9.5%, between international and domestic. Joe: Emerging markets were down about the same, 14.5%, and global real estate, so real estate around the world, was down about 6%. The U.S. bond market was flat and global bonds minus the U.S. – so international bonds were up, actually, 3%. So the case of global diversification still holds true, but we had some positive correlation here. So U.S. stocks went down, international stocks went down. International stocks went down a lot more than U.S. stocks. Al: So in a sense, they weren’t quite correlated. Joe: Right. But the bonds, however, you got 3% on international bonds. So even though you got your kind of teeth kicked in on international stocks, if you own international bonds, you got a little bit of a positive premium. Al: Yeah. Well and here are some more numbers on that. So Vanguard long term Treasury Index ETF went down 5.8% for the year. That’s the long term. The mid-term went down 2.1%, and the short term went up .2%. Joe: Yeah, that’s what I got, .01. Well, so what does that say? I mean we talked about that, like with interest rates kind of moving around, if you have long term bonds, you’re going to see some variance in the overall bond prices as interest rates move a little bit. And so the longer the term of the bond, as interest rates go up or down, you’re going to see a little bit more movement. The shorter the term, you’re not going to see nearly as much movement because there’s so much less risk, because those bonds kind of flip and mature on a very regular short basis. There was some complacency I think, where, “hey, the market’s doing pretty good for the last several years.” Overconfidence kind of probably set in. And it’s weird, the U.S. markets, Alan were down 5%, but I would say over the last several months, we’ve seen more panic and fear than I’ve seen since almost 2008. And that’s just stupid for me to say. Al: Well yeah, but a lot of the people that are in the market remember 2008 and a lot of them remember 2001 as well. Al: I know but when markets are going down no one understands that. Al: (laughs) Right. But they’re worried that we’re going to have another 45%. That’s the concern. Joe: Then what do you think. How many people listening to this program got out of the market? Al: If they listened to our advice they probably didn’t. But I would say a lot of folks do tend to jump ship when things like this happen. Joe: Christmas Eve imploded, then all of a sudden the markets are up like the highest point percentage just a few days later. It’s like, what the hell do you do? And especially over the holidays. Don’t be trading your account, folks. (laughs) Global diversification. You just kind of look at it, and they’re like, “oh, it doesn’t really work because all the stocks are down,” but some were down a little bit less than others. The biggest one that got hit the most this last year was emerging markets, small companies. By far those are the riskiest asset classes. Especially on the value side. So low priced, small companies in emerging markets. You’re going to see some huge variances of return there. Al: Yeah. And the interesting thing, Joe, about that asset class is if you look long term, it tends to be near the top because it is risky. But on a year in, year out basis, it’s all over the place. Joe: Small value in the U.S. also did not do very well. It was down about 13%. Large-cap was down 5. So if you had a small value portfolio, you saw a little bit more of a downturn then maybe let’s say the S&P 500. Large value was down about 8%. Small-cap itself was down about 11. Large growth, that was the only thing in positive territory, it was like up 1%. Thank god we got someone a lot smarter talking about this – we got Liz Ann Sonders, she’s the Chief Investment Strategist for Charles Schwab. Al: Liz Ann, thanks for joining us. Liz Ann: Oh, my pleasure. Thanks for having me. Al: Obviously we’ve had kind of a quarter that wasn’t the best, the fourth quarter of last year, to put it mildly. There’s a lot of volatility. Do you see that continuing going forward? Liz Ann: I do, in fact, I think the volatility that we saw in 2018, whether you measure it by the volatility index, the VIX, or other metrics, well up from 2017, but actually not to anything resembling an extreme, historically. So I think the message associated with that is that the lack of volatility that we saw in 2017 was the exception not the rule, and what we saw last year was closer to the rule. And I think that’s likely to persist, maybe not for the full year of 2019, but easily in the first half. Al: I think a lot of people forget, the stock market is generally volatile, and we’ve had such a period of calm. Now we kind of think it’s abnormal, but this is actually more normal. Liz Ann: Correct. Absolutely. And especially given that we’re later in the economic cycle, that tends to bring in heightened levels of volatility for myriad reasons, and I think that’s very much in keeping with what we have been seeing and likely we’ll continue to see this year. Brian Perry: In staying along that line of what’s causing the volatility, what is causing it? You referenced several things in your 2019 outlook, including one thing that seems important to me is the tightening financial conditions. Is that what people are worried about? Is it tariffs? Is it just that the economic recovery is long in the tooth? What’s what’s actually causing this? Liz Ann: I think it’s all of the above. You mentioned financial conditions, which are often linked directly to monetary policy, but there are more factors than just the trend in interest rates that impact overall financial conditions. Currency movements, specifically the dollar, causes financial conditions to either tighten or loosen, even equity market volatility can have an impact on financial conditions. And I think why it’s been different this year is that, even though the Fed has been raising interest rates for more than three years now, for the first two years of the rate hiking cycle – so basically 2016 and 2017 – monetary policy was getting tighter, i.e. the Fed was raising interest rates. But overall financial conditions were getting progressively looser. So the Fed was actually tightening into looser financial conditions. And that was one of the reasons why they felt they could sort of be steady as she goes because they weren’t really having an impact on financial conditions. Fast forward to the beginning of 2018, and with the strength in the dollar, with the increased volatility in the equity market, at least two corrections that we saw during the year, you saw a big pickup in financial conditions. And at the same time, the Fed has also been shrinking its balance sheet. So you sort of have this triple whammy now, where the Fed is not only raising interest rates, or has been raising interest rates, they’ve also been shrinking their balance sheet, and at the same time, overall financial conditions have been tightening. So that in and of itself is a recipe for volatility, and then you add other late-cycle tendencies and the ongoing trade war and the uncertainty associated with that, and you easily have the conditions for heightened volatility and a weaker stock market, which we certainly got last year. Al: So, certainly we’ve had such a long period of recovery, and of course people are very worried about recessions, and can you comment on what’s your outlook for 2019 and beyond? Liz Ann: Well, we are going to get another recession. That’s inevitable. It’s just a question of the length of runway between now and the next recession, and I think some of the things we’ve already discussed – the path of interest rates related to that, the shape of the yield curve, resolution or lack thereof on trade, I think will all hold the key to what the length of runway is between now and the next recession. I do think that, if pretty much everything that I mentioned moves away from an optimistic case, I think a recession is possible starting in 2019 – probably not imminently, but maybe later in the year and especially if we get an inversion in the traditional yield curve. But there are circumstances under which we could push the next recession further out, 2020, maybe even 2021, if we see the Fed kind of back off interest rate increases, but for reasons that would be beneficial as well to the stock market – kind of reverting back into a Goldilocks type of environment, where economic growth stays reasonably strong but doesn’t bring inflation with it. Maybe you start to see a little bit less of a tight labor market, without the labor market imploding. At the same time, you get some sort of deal on trade. All of those things are a lot to ask for – and I would add to that, maybe not eliminate, but lessen some of the political and geopolitical volatility – then I think you have a recipe for pushing the recession further out, especially if somehow we get some sort of productivity boost along the way. That may be pie in the sky hopes. And again, we are getting another recession, it’s just a question of whether it’s one that starts in 2019 or can be pushed further down. And we’re not necessarily going to get an answer to those all at the same time I think it’s going to be over the course of the next several months. I think we’ll have a better sense of how long that runway is. Brian: And so with worries about – you mentioned the inverted yield curve and the tighter financial conditions, and obviously at some point a recession, whether that’s 2019 or beyond – what does that mean for the Fed as far as future rate increases? And I guess as a corollary to that, how concerned are you about the Fed coming under political pressure from Trump or from anybody else? Do you think that, longer term, that could have some negative impacts? Liz Ann: Well, I think what the Fed did at the December meeting in raising rates, obviously into a volatile equity market, had maybe two meanings to it. One, I think, whether explicitly or subliminally, the Fed wanting to push back against political pressure and make sure the market understood that it was going to make decisions with an independent mindset. Now, I don’t think that alone was the reason why they raised interest rates. I think the more important one, which is outside the subject of political pressure, is that – in fact, I attended Fed Chair Jerome Powell’s lunch in December at the Economic Club of New York, and although much of the press focused on his comment during that lunch that the Fed funds rate was “just below” the neutral rate, which calmed a lot of investors, relative to what he had said a couple of months before, which was that the Fed funds rate was still “well below” the neutral rate. So there was a shift in thinking that maybe the Fed was getting close to being finished with what he said in December. But what I thought was the more important thing that Powell mentioned, and it was just looking at his body language, looking at the way he sort of made eye contact with the room. He said, “it’s very important that we distinguish between financial market volatility and financial system stability when making monetary policy decisions,” which in other words is, market volatility alone is not going to drive our decision making. We are not simply going to react to volatility in the stock market. We are going to react to the conditions associated with our mandates – dual mandate of full employment and price stability in conjunction with financial system stability. So I think he wanted to maybe push off this notion that yet again we had this sort of put. We went from the Bernanke put to the Yellen put to now the Powell put – that any kind of market riot period was going to be enough to cause the Fed to step in and, in whatever form, move that monetary policy lever, and I think he was very clear that they were not going to do that. And I think that was the primary reason why they decided to move in December. But then, of course, Powell getting a little bit more dovish and reinforcing the data dependency. So looking ahead, there is no predetermined path. It’s not like the Fed knows what it’s going to do and they’re just waiting to drip out the information to us lowly market watchers I think, given how strong the jobs report was, and in particular the wage component, you see another report or two like that, I think this notion that the Fed has done will not be supported by the data. If what we saw was a one-off and we see a weakening in job growth and lessening pressure in wages, then it is possible the Fed is sort of done, at least for now, in this cycle. So I think the next couple of months are key to figuring that out. I don’t think the Fed does anything in January, but March I think is still on the table. We’re speaking with Liz Ann Sonders, Chief Investment Strategist for Charles Schwab & Company. You’ll find a transcript of this interview, as well as a link to Liz Ann’s 2019 Market Outlook: Ten Years Gone in the show notes for today’s podcast episode at YourMoneyYourWealth.com. In her 2019 Market Outlook, Liz Ann goes more in-depth on tightening financial conditions, the yield curve, rolling bear markets, and other recession indicators. Now, more with Liz Ann Sonders. Al: You talked about rolling bear markets that we’ve seen in things like emerging markets stocks, energy, and now FAANG stocks. Can you talk more about this concept and what impact rolling bear markets maybe would have on investors, and what they should do about it? Liz Ann: Sure, you can actually take it back to the beginning of 2018, and we’ve had these, whether you call them rolling bear markets or micro-bubbles that have popped. I put together a cartoon for Schwab’s Impact Conference more than a year ago, so the November 2017 conference, that showed at the time the three major global central bankers – it was Janet Yellen at the time at the Fed of course, and then Kuroda and Draghi at the Bank of Japan and European Central Bank, and they were blowing bubbles using, you know, the kid wands that we used to use that you’d dip in what is basically just soap, and blow bubbles, and in the bubbles I labeled them a number of different asset classes. I had one labeled Bitcoin, I had one labeled FAANGs, I had one labeled short vol, one labeled risk parity – positing that, although we didn’t have some massive systemic bubble, we probably had inflated asset classes by virtue of central bank liquidity that might be seen as micro-bubbles that that were likely to pop in an environment of receding liquidity. Well, fast forward to late January/February of 2018, and the short vol bubble popped spectacularly. Ultimately, we got it in bitcoin and the other cryptocurrencies, we saw it in the FAANG stocks, we saw it in emerging markets, we saw it in small caps, we saw it in oil. So we’ve had these rolling corrections, bubble bursts, bear markets, whatever you want to call them, that have just kind of hit one asset class at a time without taking the entire system or the entire market down with it. That’s not a bad environment. There are worse ways to experience a bear market. In the case of the S&P, we got, at the recent trough, down about 19.8%. It’s incredible how common it is. We’ve had six instances, in the kind of “modern era” of the stock market, where the market has gone down more than 19% but stopped short of that negative 20%, which may have to do with sort of technical, when you hit a threshold, where buying interest steps in. But it also tends to be bear markets or close-to-bear-markets that occur when you don’t have an economic recession coming. They’re sort of non-recession bear markets or non-recession almost-bear-markets. Whether or not we look back at this one and say, “you know, it was indeed the sixth one,” or that the down 19.8 was just sort of the opening salvo into a true bear market, I think whether or not we get a recession this year is key to answering that question. Brian: You talked a couple times about financial stability and the Federal Reserve, and you know, maybe I’m still scarred from 2008, but every time that the market seems to fall now, or there’s some volatility, you start to see headlines around, “is financial stability improved and how safe are the banks?” What is your take on that? Because as you mentioned, at some point we will have a recession, we will have a sharp bear market. But do you think they’ll be more a “normal” recession and bear market, as opposed to the sort of systemic crisis we faced 10 years ago? Liz Ann: Yes, we do think that the next recession is more likely to be garden variety. Now, the only thing that could trip that up is if the fractures we’re seeing within the corporate debt market, which right now are largely limited to the lowest quality spectrum, even within investment grade – you know, the triple B-rated companies – and admittedly, there are more triple B-rated companies within the so-called investment grade sphere than has ever been before, and there’s a decent percentage of those that are kind of in trouble, if not dire straits. It is still fairly contained in a world of corporate debt otherwise being easily managed by the ample liquidity that companies have. So barring some sort of whale coming to the surface that that is unforeseen at this point, we think the next recession is likely to be more garden variety because there isn’t a big whopper systemic bubble, like the housing bubble, with massive trillions of dollars of derivatives tied to it weighing down a global financial system that was levered to the hilt. So leverage ratios are way down. Banks are much more well-capitalized, not just for regulatory reasons, but sort of self-preservation reasons, so we don’t see the next cycle as one that looks like the ’07 and ’09 cycle. And to your point about how you started the question with you sort of have seared in your memory that experience – I think there is a lot of muscle memory that has many investors on guard, because it was not only a severe bear market in ’07 to ’09, but the one prior to that was also a massive bubble burst and severe bear market. So it’s no wonder that muscle memory is still sort of seared in people’s minds. But we do think this next one is more likely, not guaranteed to be, but more likely to be of the milder variety. Al: But yet, given the fact that we are a bit scarred and given the fact we had a poor stock market in Q4, very poor stock market, and given the fact that you’ve identified a bunch of risks, how do we stay calm in this market? Liz Ann: Well, there are there are some things investors can do. First of all, I think taking an approach around discipline, regardless of the environment, is the first thing to do when starting or at any point in the process. I think if you sit down and you think, “okay, am I winging it or do I have a disciplined process here? Is it tied to my risk tolerance and time horizon and everything associated with both of those things? Am I taking an approach around asset allocation and rebalancing that is also disciplined?” That’s about as close as you get to a free lunch. Now, you know, we have investors at Schwab who, although take a strategic long term approach to investing, also sometimes want to make tactical shifts around that strategic allocation. They want to try to get a little bit of an edge and that’s where some of what we do comes into play with our tactical recommendations. So over the past year, we have gotten decidedly more defensive in what we’re recommending tactically for investors. So about a year and a half ago we moved overall global equity exposure down to neutral. Within that, the only area of emphasis in the last year has been U.S. large caps at the expense of U.S. small caps, but also a little bit of an underweight to emerging markets. And then more recently, in August of 2018, we took down two of the riskier sector recommendations – so technology and financials we moved from outperform to neutral, and we moved up utilities and REITs from underperform to neutral. So really reflecting that need to take a little bit more of a defensive, non-cyclical, more value-oriented approach within equity portfolios. So that’s that’s how we’ve reflected it. Also, reinforcing the benefits of rebalancing, especially in a more volatile environment, because the beautiful thing about rebalancing is it forces us as investors to do what we know we’re supposed to do, which is maybe not buy low, sell high, but kind o,f you know, add low, trim high. Take advantage of volatility, pare back where you have outsized gains based on prior gains, and that kind of keeps you on the right side of the market in general. So we don’t make bombastic all-or-nothing calls, we’re not market timers. So what I just described is the way we reflect what has been a more defensive posture over the past year. Brian: I’m glad to hear you say that, because one of the things that a lot of people face, and I’m sure that you come into contact with this a lot, is the investor that sees the Dow fall 15% in a quarter or whatever, and then just wants to get out and go to cash, as opposed to taking the more nuanced stance. How do you answer that question, because I’m certain you’ve gotten it more than a couple times. Liz Ann: I get it all the time, and my answer is the same all the time, regardless of the environment, and regardless of my view on the market. I would answer this if I had an unbelievably bullish view on the market or vice versa, and that is that, especially given that the question is often asked with those exact terms, sort of “get in or get out,” my answer is always, “neither get in or get out is an investing strategy, that’s gambling on a moment in time. And investing should never be about gambling on a moment in time. It should always be a process over time.” And when you think about “get in and get out,” which infers all or nothing kind of moves, that requires you are, not just a perfect market timer, but that you do it right in both directions. You get out at the right time, you get back in at the right time and vice versa. No one can do it. And more often than not, if you attempt that, if that’s how you’re managing your money, you will make grave, grave errors. And at the end of the day, whatever that is: figurative day, you know, the 10 year, 15 years, 20 years, whatever it is – your time horizon, you’re going to end up faring much worse than whatever benchmark it is, in some cases even relatively conservative benchmarks. So it should always be a process over time, never about a moment in time, and never all or nothing. Liz Ann: I’m glad you just said that because that perfectly ties to what you said just prior to that. Which is that every investor is different in terms of their risk tolerance and time horizon. And there are so many factors that make each individual different. It’s not just about age and time horizon. Too often investors say, “okay, I’m young, I have a long time horizon, therefore I can take a more aggressive approach.” Well, if you’re going to panic at the first 10% drop in your portfolio and sell everything, I don’t care how young you are, you are not a risk tolerant investor. So what also drives me crazy, aside from the question I often get, “are you telling investors to get in or get out,” which we already talked about, is, “well, what are you recommending to clients? What’s your asset allocation recommendation?” As if one asset allocation recommendation is right for every investor. And it drives me crazy how often I hear people, pundits, who get that question who actually answer it. And they’ll say, “60/30/10.” I’m being very generic, but as if that’s right for everybody. If you are 25 years old and you just inherited 10 million dollars and you go bungee jumping on the weekend, you don’t need the money, you’re not going to obsess over it. You don’t need to earn income on it, versus a 75-year-old who needs to keep everything they made and needs to earn income on that. Well, I could have a very singular, high-conviction view of what I think the market is going to do, but what I would tell those two investors are entirely different things. Too often we hear people answer that question. Al: Yeah, and it’s even to the point like you could have two 80-year-olds, one needs every penny for their own expenses, the other one doesn’t need a penny at all, it’s for their grandkids. So, of course, that’s going to be a different investment philosophy. Liz Ann: Exactly. Clearly. I met the late great Sir John Templeton when he was in his 90s, and we had an interesting conversation about how aggressive an investor he had always been. Well, one, he could afford to take the risk from a from a financial perspective. (laughs) I think he was a billionaire, and he understood the risks. He had tolerance for them. So that’s another example of age not necessarily being the single determinant of whether you’re a risk-tolerant or a risk-averse investor. Al: Liz Ann, you’ve given us so much good information, what did we forget to ask you? Liz Ann: Well, the one thing I would say that’s been interesting throughout this bull market is that up until the beginning of 2018, sentiment was so subdued. There was so much skepticism about this bull market and sort of latent fear that was part of that muscle memory. And it was like somebody just flipped a switch in January of 2018, and optimism just went absolutely through the roof. And that was a big warning sign for me personally, because I’ve been a sentiment watcher for a long time, and I had one of those, “hmm, uh-oh” moments in January, which caused us to really express our concerns about the market a bit more forcefully than we had been doing. You had the inevitable correction that came shortly in the aftermath of that, and then sentiment got more subdued. But then in August and September, it ramped again, and that same kind of little bell going off, “hmm, boy, this is this is probably not going to end well.” And then of course, the market clocks those optimistic investors with what happened in October, November, and December. So I think another thing that will be key to watch in the near term, is how quickly sentiment swings. I think sentiment isn’t always an important factor to watch, if you could get that right you almost don’t need all the other fundamental things, but I think because of how volatile markets have been, my guess is sentiment is going to swing a little bit more wildly than it would in a normal market environment. Al: Liz Ann, great information. Liz Ann Sonders, Senior Vice President, Chief Investment Strategist with Charles Schwab & Company. Thank you so much for joining us today. Liz Ann: My pleasure. Thanks for having me. Don’t forget to share today’s Your Money, Your Wealth® podcast across LinkedIn, Facebook, Twitter, and email for anyone that would benefit from Liz Ann Sonders’ insight. Find a link to her 2019 Market Outlook in the podcast show notes at YourMoneyYourWealth.com, along with Brian Perry’s free comprehensive video guide on the history of bear markets, recession indicators, and bear market investing strategies. 27:17 – Keep Saving or Have More Fun? Save for Kids’ College or Our Own Retirement? Joe: This one – this is a long distance e-mail. This is a postcard. It’s Michael from Malaysia. Al: Malaysia! Have you been to Malaysia? Andi: Alan have you been to Malaysia? Al: No. But my son has. Joe: “Good day…” That must be near Australia? Al: Yeah, longitude is up and down. It’s well above Australia. Joe: Got it. All right. “Good day Joe and Al. Big fan here from Malaysia. I’ve been listening to you since a year ago. Here’s my question. Me and my wife, both 41, are totally debt free, house and everything.” Congratulations, Michael.” We have two girls ages 13 and 10. Currently we’re saving around 55% of our after-tax income.” 55% there, Big Al. Al: Wow. That’s very nice. Joe: Michael from Malaysia, saving 55% of his income, wanting to know should he keep saving or have more fun. Michael, have more fun! What the hell are you doing saving 55% of your income! Al: (laughs) I would say it this way, I think if you want to retire, I mean just in general, if you want to retire in your 60s, we would say you probably ought to be saving at least 15% of your income, maybe 20. But say 15 or 20, and I know for a lot of people that’s very hard to even get to that level. But now you want to retire at 55, so that’s earlier, so you might be a slightly higher percentage, but 55% strikes me as pretty high. That would be a percentage if you wanted to be part of the FIRE movement, financial independence retire early, in about your age currently. So yeah, I would agree with you Joe. So Michael, have some more fun. Joe: Yeah. Well I guess we gotta know Michael’s salary. if he makes $10,000 a year, 55% is probably right on. Al: (laughs) We also need to know how much he’s already saved. If he’s saved nothing to this point it’s a different answer. Al: Well yeah. On the surface, saving 55% your income is above and beyond what you need to do. In general. You like that answer? Joe: (laughs) Yeah. Allegedly. Secondly, OK, well what’s the savings ratio? What say you on this Al? Savings ratio between retirement and college funds? Are you going to get fired up again? (laughs) That was a few years ago. Al: Yeah. No I’m over that. (laughs) My college fund experience. Anyway, so I would say it this way: if you’re saving 15 to 20% of your income for your own retirement, then I want you to do that first and then you could go back and figure out what you really need to save for college. It’s not a ratio, it’s more what’s the need. And let’s just say that’s 10%, just to throw at a number. And so you still have extra. Have fun with that, or save a little bit more. I would kind of think about that way. Joe: Here’s what I would do Michael, is to look at, you have two kids, 13 and 10. One child is going to go to school in five years, four or five years, depending on when they graduate. I graduated at 17, Al graduated probably at 19. (laughs) And then the 10 year old, so let’s say you have five and seven years, or five and eight years for both of those kids. So you look at, well how much do you want to fund? Do you want to fund a state school? What’s the school cost in Malaysia? I have no idea. Do you want to come to wherever? And kind of figure out exactly what that cost is and work backwards. Let’s say it’s $10,000 a year, hypothetically. So you have $40,000 that you need to save for each kid. It’s a little bit more complex because there’s inflation involved here. But you get the gist, $40,000 for each kid. Now you kind of work that backwards. You have 8 years for one child to get to that $440,000. You have five years for the other child to get to that $40,000, then you set up a savings program on a monthly basis to save into whatever plan that you choose to get to that goal. Al: Yeah, I agreed with that. So in other words, you figure out what the need is and then you can sort of calculate the percentage. You don’t start with the percentage, you gotta figure out what the need is and work backward. Joe: Right. It’s not a ratio of half and half. But if 100% of your savings is going to have to go to that college fund, then I think then that’s when you revert back to a ratio. Al: Yeah well, I think in that case, I want you to start with yourself. 15% to yourself before you do the college. Joe: Yeah, 100% agreement there. Because where we find is that all of a sudden it’s like, “I’m 41, I’m already saving 55%, I’ve got a couple of kids, you know, I’m going to stop saving for retirement. I’m going to funnel all of my free cash flow into, let’s say a 529 plan or college savings plan, and then I’ll revert back to my retirement savings.” No. Don’t do it that way. You have to take care of yourself first. Your kids can get loans, where you can’t get a loan for your retirement. Andi: (laughs) Joe’s got his retirement mapped out. Joe: Yes. Michael! Keep saving 55%. Thank you for the email. Al: All right. That’s a good one. 33:36 – Isn’t When To Take Social Security a Lifestyle Choice? Joe: Dennis, he buzzed in here from San Diego. “I know you said that it’s best to wait as long as possible to collect Social Security, and I believe that to be a sound investment decision. However, is it not a lifestyle decision as well, since you are most likely to spend money in your 60s (the Go-Go Years) as opposed to your 70s (the Slow-Go Years) or your 80s (the No-Go Years)?” Dennis, what other podcasts are you listening to? (laughs) That is the question I have. Al: Yes. We have a hunch. Joe: There are several people that use those little Go-Go, Slow-Go, No-Go years. This podcast is not one of them though. Al: We’ve never actually said that. Al: (laughs) I don’t blame you a bit. But I still haven’t said it, and I won’t. So there. Joe: (laughs) Because Al, you’re actually in your Go-Go years. Al: Barely. Just barely got over the top of that. Let’s not get too carried away here. (laughs) What are you in? Joe: I’m still trying to figure that out. (laughs) I’m still trying to figure out my years. Al: (laughs) There is no description for your generation. Joe: All right Dennis, here’s the answer: I don’t know, I’m just kind of caught up in this whole Go-Go, No-Go, Slow-Go. So what he’s saying is this: it’s like OK, which I understand, push out Social Security to age 70, that’s what a lot of financial advisors are saying now because of longevity. Al: But I don’t I don’t need it so much then. Joe: Yeah. I want the cash flow in my 60s. Al: I want to Go-Go. (laughs) I did say it now, the first part. I haven’t said all three together as you did. Joe (laughs) I don’t know Dennis. You’ve got to take a look at a few different things here. There’s this instant gratification always when it comes to money. It’s like we kind of forget our future self. So we want to spend a little bit more today, save a little bit less. And that’s why we’re kind of in this retirement “crisis,” if you will. So yeah. If you want to Go-Go and spend your Social Security and take a 25% permanent haircut – because if you take it at 62 versus full retirement age, you receive a significant reduction in benefit for the rest of your life. It’s permanent. So you could say, “well what’s the break-even then?” If you have shorter life expectancy in your No-Go years, if you’re dead, well then yeah, take it as soon as you can get it. If you need the money, take it as soon as you can get it. But if you don’t necessarily need the money, then that’s where more analysis has to come into play. Al: Yeah I I agree with that. A couple of things: I think you’ve got to look at Social Security more as almost an insurance policy for long life. Joe: It’s just longevity insurance. Al: It’s longevity insurance. So it’s a little bit different than I think a lot of people think about it. And the other thing is if you’ve got other resources, go ahead spend your money in the Go-Go years. Joe: And then you have a guaranteed fixed income source… later in life. *(laughs) I’m not going to say it. Joe: I’m not gonna go there. (laughs) We already did it. Done. Al: (laughs) I just wanna hear you say it one more time. 37:49 – 2018 Predictions: How Did the Gurus Fare? Al: Our buddy Larry Swedroe, he writes different columns, and each year he takes a look at the “can’t miss” predictions for that year and then after the year goes by, he checks to see how they did. And usually what happens is the predictions are pretty far off. But let’s see what happened this year, because he’s got like seven of them, and the first one, Joe, the first sure thing was that “U.S. economy would grow faster with GDP growth forecasted at 2.5% for 2018.” And then we take a look, it actually grew 4.2% April through June. And based upon third quarter and predictions for fourth quarter, the forecast is about 2.8%. So it actually did beat the 2.5. So that’s a that’s in the plus side. Joe: Yeah. GDP looks pretty good as well for 2019 is what some of the forecasts that I’ve seen as well. Al: Right. Second sure thing was that “The Tax Cuts and Jobs Act of 2017, along with expectations for stronger economic growth and tighter labor markets, the Federal Reserve would raise interest rates in 2018.” And yes they did. Joe: That’s kind of a layup. Joe: I have no idea what you just said. Andi: It’s the opposite of the apex. Joe: Were you speaking English? Al: Yeah I had to look it up. Andi already knew it. She’s the smartest one on this show. (laughs) Anyway, that means like when it hits a bottom – the nadir. Joe. Thank you. The nadir. Al: (laughs) So, “the nadir in commodity prices would cause inflation to rise in cyclical lows.” And I won’t go into all of the things that happened, but basically, this is a push. It didn’t really happen, but it didn’t really not happen. So here’s the fourth thing though, that, “with the help of the tax cuts, the US economy would pick up steam and corporate earnings would have a big boost.” Which is true. That’s what we saw. So that’s correct. Joe: I think that was already priced in. Way before the year. Joe: So it was priced in 2016. Right? Because of the anticipation. The bill was signed in December of 2017. And it’s like, “oh, it’s going…” I remember like it was yesterday, you and I talking, “we got this many votes in the House, and this many votes in the Senate, looks like it’s going to go through,” and then you see the stock market just start pushing forward. And so it’s like, “let me predict in 2019 the passed bill.” You know, I could be a predictor too, you flip a coin. Al: Yeah true. And half the time you’re right. Fifth sure thing follows the fourth, “with a strengthening U.S. economy and the new tax cuts encouraging U.S. multi-internationals to repatriate earnings the U.S. dollar would strengthen.” And in fact, it did. Joe: How’s that going? I haven’t really heard a lot about all the money coming back. Al: Yeah. The DXY, the Dollar Index closed at 92.1 at the beginning of the year, and at least at the end of September was 95.3. Joe: Yeah but the market doesn’t like a strong dollar. It doesn’t like a weak dollar. Joe: (laughs) It means our costs of goods are cheaper for global companies. Al: It just shows you I can’t think and speak at the same time. It’s tough. The sixth sure thing is that “stock market volatility would rise this year.” Well, I think we all agree that was true. Joe: Yep. Yeah, it was because it was pretty calm over the last couple years. Joe: Oh, we are not recommending any ETFs on this program. Al: Please. We are not. I can hardly pronounce it. Anyway, so those did not do any better or worse. Al: That’s exactly it. That’s right. Joe: So why would defense stocks… why were they predicting that? Because they thought we were going to go to war? Al: Uhhh…. doesn’t say here. Joe: Steel companies because we may or may not build a wall? Al: So anyway, the conclusion here is that five things were correct, two were a push, and none were wrong, which is the first year since 2010 when Larry Swedroe started doing this, that there were actually more right than wrong. Joe: All right, that’s it for us, we’ll see you guys next week, the show is called Your Money, Your Wealth. Special thanks to Liz Ann Sonders, Chief Investment Strategist for Charles Schwab & Co and the apex of this edition of Your Money, Your Wealth. Visit Schwab.com to learn more. Listen and subscribe to the podcast for free and on-demand at YourMoneyYourWealth.com, or subscribe on all the various podcast apps – you’ll find them in the show notes for today’s episode. And if you love the show, we’ll love you forever if you share it with everyone you know! Email your money questions to info@purefinancial.com, or call (888) 994-6257. We’ll be joined next week by Everyday Millionaires author Chris Hogan on Your Money, Your Wealth, presented by Pure Financial Advisors.